INITIAL CONSULTATION: Your remodel design begins with an initial consultation with one of our highly trained design team, during which we will discuss your like and dislikes as well as your family’s needs. We will sit down with you and listen, hear your dreams, discuss budget, take reference photos of your home and take measurements of the space(s) to be remodeled. DESIGN DEVELOPMENT: Next we will consult with our in-house team of architectural experts, building code experts and experienced project managers regarding the design development of your project. If you decide to move forward and retain our services to design your remodel, we will review & sign a design agreement to begin analyzing initial selections, reviewing budgets and create initial drawings. DESIGN SHOWROOM VISIT: For our next meeting we will meet in our Irvine Spectrum area design showroom where we will review plans and drawings. Using state-of-the-art computerized photo realistic computer rendering, our staff of technical & aesthetic experts bring your remodel vision to life! This makes it easy to visualize and make decisions. While reviewing the conceptual design, we will continue to refine the scope and budget of your project making adjustments as needed. CREATION OF CONSTRUCTION DOCUMENTS: Once you approve the conceptual design, the Sea Pointe team will create the necessary construction plans which will include a floorplans, elevations, perspectives and necessary renderings. These documents will provide the detail necessary for us to bid on the project, estimate engineering and permit costs (if needed). DEVELOPMENT FINALIZATION: We meet to review the remodel design that has been created and budget that has been established. If everything is approved, we review the final design and pricing and sign the remodeling contract which includes details of materials to be used, progress payments to be made during construction and estimated time frame from beginning to the end of your project. PRODUCTION PLANNING: Upon your approval of our estimate and the signing of the construction contract we begin ordering cabinetry & materials, allocating manpower, and creating the project schedule which includes scheduling the pre job walk, job site prep, demolition, foundation, framing, doors / windows, electrical, plumbing / gas, drywall, siding / stucco, roofing, flooring, cabinetry, trim work, painting & punch lists. PRODUCTION: We start your remodel, produce as planned and finalize punch lists. 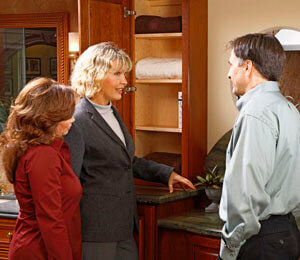 Great planning ensures a smooth remodeling experience with predictable time lines and surpassed expectations. What is Design + Build? Sea Pointe Construction proudly offers Design/Build services specifically for Orange County California. Our expertise and constant dedication to service and quality helps mitigate risk and ensure the successful completion of your project. Fundamentally, design-build embraces architecture, engineering and construction services under a single contract, thereby re-combining the vital roles of designer and constructor. Sea Pointe offers this integrated approach to construction, enhancing cooperation between all parties involved, which ultimately maximizes each of the participant’s capabilities. When incorporating the Design Build construction concept, quality, cost and time are determined concurrently. We design your remodel with value engineering in mind. Sea Pointe Construction’s expertise in this format ensures the client can save money, save time, and have the peace of mind that the end-result construction project meets their functional and aesthetic need. Any homeowner planning to remodel, wants nothing less than a professional job. Who wouldn’t want the best quality in terms of workmanship and materials when it comes to improving their most prized and valuable asset? However, when it comes to selecting a remodeler, too many buyers conveniently forget the time-proven adage “you get what you pay for.” The dilemma that confronts many homeowners is their desire for a top-notch job at the lowest possible price. With price as their primary focus, they ignore other criteria that may carry more weight in producing a successfully completed project and a smooth working relationship with the remodeler. The nature of remodeling as a service becomes even more pronounced when you consider that you’ll be sharing your home with the remodelers crews for weeks or even months, depending on the scale of the project. All remodeling involves some degree of inconvenience, but inconvenience can turn into a nightmare if your remodeler doesn’t put your family’s comfort and concerns first. Rather than selecting a remodeler based on where one bid falls compared to others, shift your focus to finding a professional remodeler. A professional remodeling firm will offer you important services – years of experience, a network of suppliers and trade contractors, and an in-depth understanding of legal regulations, cost estimating, scheduling and the most current construction techniques. When you find an experienced remodeler that you are comfortable with and have confidence in, but the bid is higher than what you budgeted, work with them to decide where you can cut back or what you can postpone to reduce the cost. You can always have the remodeler frame in a fireplace to be installed later, but they can’t upgrade the company’s customer service and workmanship if there wasn’t any to begin with. Experience – How long has the remodeler been in business? The Bureau of Labor Statistics tracked business enterprises in ten major industries from 1998 to 2005. They found that 57% of new construction firms were no longer in business by the end of their fourth year and 70% had failed by the end of their seventh year. Longevity suggests financial stability, critical in this economy, which is necessary for the remodeler to finish the project and still be available if problems come up after the job is completed. Also, the more jobs the company has done, the more expertise the remodeler will bring to your job and the hidden surprises that remodeling typically involves. Reputation – A remodeler’s former and current customers are the best source to gauge the company’s reputation. Ask for the names and phone numbers of customers you can call to find out their evaluation of the company’s work and customer service. If possible, get references from customers whose projects were similar to the one your family is planning and visit to see the work done. You can also go visit a job in progress to see how the company manages the construction process and how clean they keep the job site. Inquire as to whether these homeowners would hire the remodeler again. Business Credentials – Find out which professional associations and groups the remodeler belongs to. Groups like these help to keep their members informed about new products, construction techniques, business practices and industry issues. 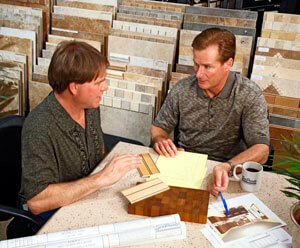 Participation demonstrates a remodeler’s commitment to professionalism and to the remodeling industry. License and Insurances – Ask for the contractor’s license number and then go online to the state licensing board to make sure it is under the correct name, is current, is the proper license for your type of project, and to find out if there are any unresolved complaints against the company. The address for California is www.cslb.ca.gov. This site will also show you the contractor’s bond and workers compensation insurance information. In addition, it is also important to verify that the contractor carries liability insurance. Have the remodeler show you copies of both their worker compensation and liability insurance certificates to protect yourself from legal responsibility in situations involving job site injuries or property damage resulting from the work being performed on your home. See below for further information on the importance of proper insurance coverage by your contractor. Property Damage – These are damages to the homeowner’s property that occur while working on the job site. Examples would be a drill dropping on the tile floor and breaking the tiles to breaking a water pipe and flooding the home. A contractor’s liability policy would pay to replace the damaged property and any costs incurred for clean up. Bodily Injury – This covers injuries to a third party, such as a guest of the homeowner, that are caused by the construction going on in the home. An example of this might be a guest that trips over a ladder left out or an electrical power cord and injures themselves. If the contractor is not covered, and the injury is severe enough, the third party may then sue the homeowner. Completed Operations – This covers defects that occur after the project is completed. This could be several months or several years after completion. Leaking windows that cause damage to walls or foundations from an addition that starts to move causing cracks and stress on the original structure are examples. Completed operations is the most important coverage a contractor can have. The most common recommended limits for liability insurance are $2 Million General Aggregate, $1 Million Products/Completed Operations Aggregate and $1 Million each occurrence. Auto liability at $1 Million is also recommended. In regard to workers compensation insurance, it is mandatory that an employer provide coverage for its employees. If a contractor does not carry workers compensation, then they are not in compliance with California state law. If they are not carrying the coverage and one of their employees is injured on the homeowner’s premises, the homeowner could be drawn into a lawsuit and be liable for medical expenses. Every step in our budgeting process is designed to help our clients move through the remodeling process with as much control and understanding as possible. Surprise costs are rarely appreciated so we do everything we can to eliminate them. Beginning a project with Sea Pointe Construction entails first meeting for an in-depth conversation about the scope of work, the problems you are hoping to solve, and what budget you may have already established. We will involve members of our design team to assist in providing budget information after early site visits. This collaborative approach allows us to get a tighter handle on the unique issues that we need to consider for your project and to get a realistic budget early in the process. 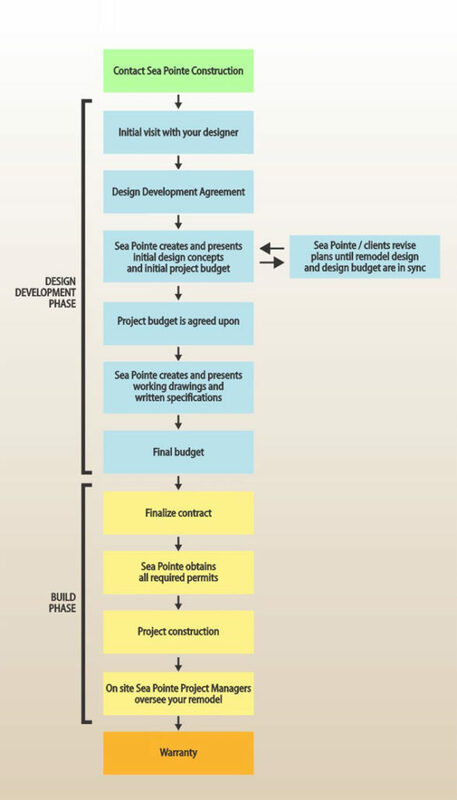 One of the first steps in the budget process is to enter into a Design Agreement. The purpose of this Agreement is to provide the homeowner with valuable planning and design services while allowing the free flow of information and cost analysis. Sea Pointe will provide design and working drawings for the purposes of finalizing a budget and contract to remodel the proposed project. The design fee will cover interior floor plans, elevations and perspectives. Sea Pointe will also provide color and material selection services to help co-ordinate the materials used for cabinets, counters, walls and flooring. Upon completion of the preliminary plans a proposed cost budget will be drafted. This will be refined with the homeowner and the design to reach an acceptable job budget. The final step in the budget process is to create the project contract that contains all the specifications and items agreed upon in the Design Agreement phase. 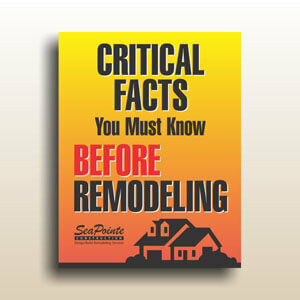 A change order is a written agreement between the client and the general contractor to change a remodeling contract. Change orders add to, delete from, or otherwise alter the work set forth in the contract documents at the time that the construction contract was bid. As the legal means for changing contracts, change orders are standard in the construction industry. Change orders can be generated because of code changes, unforeseen conditions, or homeowners wanting to add or change the remodel project. Sea Pointe Construction averages about three to four percent change order compared to a national average of 25 percent or more. A company with a low change order rate like Sea Pointe indicates that the necessary time in the design and research phases is taken to ensure that the project meets code requirements and the clients’ needs.